The official name is Feira de Artezanato de Ipanema (Handcrafts & Art Fair of Ipanema), but everybody still uses the original name, Hippy Market, reminiscent of the 70´s. Typical foods, handmade art, Brazilian leather goods, paintings, jewelry, and many more attractions are found at this weekly event. It is the perfect place to find a souvenir with local colors. Or, just walk around leisurely, and enjoy the moment. This is a short walk from the hotel, and once there, you may choose to wander on your own within the market plaza and return to the hotel (or beach) whenever you choose. This market only takes place on Sundays. The buffet is situated in a long air-conditioned conservatory, set against the perfect blue swimming pool on one side and the sparkling green of the Atlantic Ocean on the other. Limitless champagne is served by creaseless waiters who pour with a smile. The ten meter-long buffet awaiting the mixture of Palace guests, well-to-do Cariocas, and intrigued others is straight out of a medieval costume drama, piled high with oysters, caviar, slow-cooked lamb, salmon, hams, and cheeses. A chef dressed in pressed whites cooks pasta on demand. The desert counter is divine, boasting five types of cheesecake. It really is all about the details. Suggested attire: country club casual, no jackets. 7A to 10A: Included Buffet Breakfast is served in the Ipanema Plaza Hotel Opium Restaurant. Late Morning/Afternoon: Helicopter Tour and Lunch at Sugarloaf Mountain. Signature Zoom Event™ Our helicopter tour of Rio de Janeiro with a sensational lunch and tour of Sugarloaf Mountain! Today, you will enjoy one of the most famous gay beaches in the world, while Zoom Vacations takes care of all the logistics, from beverages to bites to beach chairs and beyond! Just steps from our hotel, Farme Beach is very international and friendly, and offers beautiful views of Ipanema, Corcovado, and the Dois Irmãos (Two Brothers) Peaks. Of course, these may not be the main things catching your eye on Farme Beach. 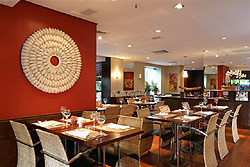 7A to 11A: Included Buffet Breakfast is served in the Ipanema Plaza Hotel Opium Restaurant. Bring your cameras and a healthy appetite to this special New Years Eve celebration exclusively for Zoom Vacations® guests. Nighttime: Copacabana Beach & Fireworks. 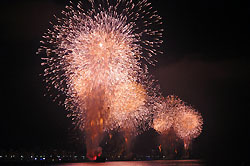 We take a slow, 30 minute walk to Copacabana Beach where we will watch the fireworks. You will be invited to give a flower offering to the Brazilian sea goddess Yemanja, and in exchange she will cleanse your sins for the past year. We will watch a spectacular fireworks display on the waters edge where millions of Cariocas (as Rio locals are called) dress in white and gather to greet the New Year. The tradition in Rio over New Years is that everyone from the locals to the tourists wear white on New Years Eve. Today, the day is free to recover from New Years Eve. You may also wish to attend the pool party or one of the many other parties and events taking place today. Our Zoom Concierges will help make sure that your New Year is off to a great start! 12 Noon: Hotel Check Out. If you are leaving Rio today and not joining Zoom on the Paraty extension, the Ipanema Plaza Hotel will gladly store your luggage while you explore the day in Rio prior to your flight. You are welcome to use the showers in the gym area if you wish to freshen up before your flight home. 9:30A-10A: NOTE: Paraty Travelers Only. Check out of the Ipanema Plaza Hotel early, meet at the Ipanema Plaza Hotel Lobby, and load luggage onto bus for departure to Paraty. 10A (sharp): Paraty Departure for the group attending the Paraty add-on. 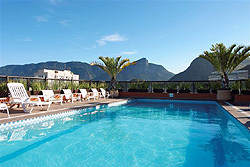 • Ipanema Plaza Hotel. This 4 star property is the closest hotel to the gay beach, and is truly the hot spot for the week! Passports: Your valid passport should have at least two blank pages and should be valid for at least six months after your planned departure from the country you are visiting. Visas: Please note that currently US citizens must have a Brazilian Visa to enter Brazil. If you are not a US citizen, please contact your nearest Brazilian Consulate to determine your visa requirements. While Zoom Vacations will assist when possible, please note that passport, visa, and vaccination requirements vary from country to country and are the sole responsibility of the traveler. If you are a US resident, you may click here for more information on passport, visa, and vaccination requirements for various countries. *Land only Introductory rate, based on double occupancy. Prices are subject to change. Need a roommate? Zoom Vacations® is happy to match you with someone, at no additional charge. Or, you may pay a single supplement and go as a single. Please read Terms and Conditions prior to booking. Zoom Vacations®' gay group tour to Rio for Carnaval gives our travelers the most incredible experience in Rio de Janeiro. Events unique to Zoom Vacations®, plus front row seats at the Sambadromo and tickets to the best party in town make this an amazing experience one will never forget. Our upcoming trips to Rio for New Years and Carnaval promise to be equally extraordinary. Paraty is a small gay-friendly colonial town on the west coast between Rio de Janeiro and Sao Paulo. With beautiful beaches and undisturbed nature it also boasts over 400 years of history. It was one of the most important ports of Brazil and it's name was synonymous with cachaça. Today, it is known as one of the most gay-friendly places in Brazil. Paraty was one of the most important towns in Brazil during the Gold Cycle. Today Paraty is a small historic town with elegant stores and many quaint hotels and inns that receive visitors from all over the world. From Paraty, one can easily get to over 65 islands, many with private beaches, swimming coves, and charming, rustic restaurants. 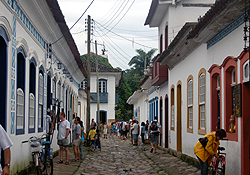 Paraty (para-chee) is a popular destination for European tourists but is unknown by most Americans. The old colonial homes are white-washed, embellished with intricate colored moldings. The roads are paved with river stone and cars are not allowed on the streets in the historic center. In the evenings, jazz music spills out from yellow-lit doorways, and impeccable cuisine abounds in authentic restaurants. • Round trip transfer by luxury motorcoach (about 3.5 hours through stunning scenery) with tons of food, drinks, movies, etc. • Fabulous Boutique Accommodations in the historic city center. • Island hopping by boat among 65 scenic islands. • A fabulous lunch on a private island. • Unique dining experience with a famous Brazilian chief using local ingredients from the Brazilian Amazon. You are invited into the private home of Yara Castro Roberts, where using local ingredients, Yara demonstrates the preparation of a typical Brazilian meal. 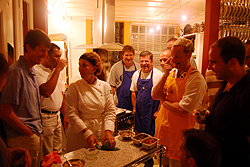 The experience is enhanced as guests participate and share in the preparation of this incredible culinary experience. The stories, the fun and the drink flow to make this a once-in-a-lifetime experience. Dinner, drinks, and wine included! All I can say about my experience with Zoom and Rio is that my friends and family are sick and tired of my stories of how wonderful everything was. You can hear it, read it or even see pictures/video, but it will never even come close to living it...thank you for an incredible memory! Man, did I have a blast! Thanks for hanging with me and making this trip so great. I want to go again next year. I have been telling all my friends about how great Zoom Vacations® treated us and how they should take part. We had a blast. It was the best vacation I have ever taken. I thought being in a group might be stifling or a drag-- but having 70 instant friends was awesome. (I am very shy and find it hard to meet folks… LOL). You do GREAT work. I sincerely want to thank you for what could possibly be the best trip of my life. I knew that I was going to like it but I never expected to be as GREAT as it was. You guys gave us the best New Years (and I'm talking also from many, many great comments that I heard from some of the other guys of our group). I'm very happy that I made the decision of going to Rio with ZOOM, and I also know that this is just the first of many vacations that I'm going to put in your hands. I had a wonderful time! Truly the best vacation I ever had! I had the good fortune of meeting Joel Cabrera here in New York during PRIDE 2004 and I said that if I ever went to Brazil, which I have been dying (my hair) to do for years, that I would give him a call. Fate stepped in and I had the best vacation ever. I want to thank you for a marvelous trip. I thoroughly enjoyed it and have recommended Zoom Vacations® to numerous people. I appreciate all the hard work you put into the adventure to make it one of the most pleasurable and memorable vacations I’ve ever had. I especially enjoyed all the new friends I met. Please receive our thanks for arranging such a wonderful trip. In addition to making new friendships and enjoying Rio de Janeiro, you helped us make our seventh anniversary a happy occasion. We hope to see you in our travels in 2005. We want to thank you for a much needed and wonderful vacation in Rio. We had an amazing time! You sure do know how to put together an incredible adventure we will remember for the rest of our lives. The itinerary of events, the friendships and the amazing men made for an experience we would recommend to everyone. Thank you! Thank you! Thank you! At least I still have my Brazilian tan to show for the phenomenal time that you guys provided for all of us. I can't thank you guys enough for all of the amazing care and special touches you thought of to bring 2003 to a great end and to make the new year start off in the best possible way! Just wanted to say thanks for putting together such a fantastic itinerary and trip to Rio. It was truly one of the best vacations I have had in several years....the weather, the activities, and the people too...a really nice group of people came together for the trip. You guys really out did (is that a word?) yourselves on the activities. I'll definitely be giving you a glowing review to anyone who asks about my experience with your travel company. Just a quick note to let you know how much fun we had in Brazil. THANK YOU for doing such a fantastic job for us. Your planning and the choices you made were perfect, but it was the personal touches, your warmth, and the ease with which you handled each day that really made a lasting impression with us. There had to be a lot of behind-the-scenes stress that you never showed, and that is truly amazing considering the detail involved, and the high expectations of your clientele. Thanks for organizing a great time in Rio. We both had a fun and relaxing time. We’re not the best tourists as we often like to do our own thing, at our own pace. But your organization allowed us to do just that, so thank you for making our Rio Adventure another great experience. Click here to read more testimonials on our testimonials page.